History has shown us time and again that what is right is not what is popular. The difference between us is that we're using missile defense to protect our civilians and they're using their civilians to protect their missiles. I will plant them upon their soil never to be uprooted again. Ladies and gentlemen, the people of Israel have come home never to be uprooted again. I have heard of an attempt to move a woman from her seat on a bus. I oppose this unequivocally. I believe we must not allow margins groups to break our common denominator and we must keep our public spaces open and safe for all of our citizens. We must find the uniting and mediating ground rather than the things that divide and separate us. When we say never again, we mean never again! Israel always reserves the right to defend itself. I can guarantee you this, the days when the Jewish people remained passive in the face of genocidal enemies, those days are over! We'll attack anyone who tries to harm our citizens. Even if Israel has to stand alone, Israel will stand. But I know that Israel does not stand alone. I know that America stands with Israel. We will bring a comprehensive plan to the government to assist you in every way. There is no room for racism and discrimination in our society, none... We will turn racism into something contemptible and despicable. I know what America is. America is a thing you can move very easily, move it in the right direction. They won't get in our way. 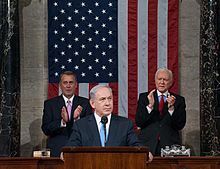 Benjamin Netanyahu (born 21 October 1949), often called "Bibi", was the 9th and is the current Prime Minister of Israel and is chairman of the Israeli Likud Party. We are benefiting from one thing, and that is the attack on the Twin Towers and Pentagon, and the American struggle in Iraq. [The events] swung American public opinion in our favor. We cannot accept the fact that Jews wouldn't be entitled to live and buy anywhere in Jerusalem. I can only imagine what would happen if someone suggested Jews could not live in certain neighborhoods in New York, London, Paris or Rome. There would certainly be a major international outcry. I know what America is. America is a thing you can move very easily, move it in the right direction. They won't get in our way. … They asked me before the election if I'd honor [the Oslo accords] … I said I would, but … I'm going to interpret the accords in such a way that would allow me to put an end to this galloping forward to the '67 borders. How did we do it? Nobody said what defined military zones were. Defined military zones are security zones; as far as I'm concerned, the entire Jordan Valley is a defined military zone. Go argue. In recent days we witness attempts to break this coexistence apart. Today, for example, I have heard of an attempt to move a woman from her seat on a bus. I oppose this unequivocally. I believe we must not allow margins groups to break our common denominator and we must keep our public spaces open and safe for all of our citizens. We must find the uniting and mediating ground rather than the things that divide and separate us. "Israel's 'Rosa Parks' refuses to take back seat" on CNN.com (19 December 2011). Address to the U.N. General Assembly (23 September 2011). Israel has no better friend than America. And America has no better friend than Israel. We stand together to defend democracy. We stand together to advance peace. We stand together to fight terrorism. Congratulations America. Congratulations, Mister President. You got bin Laden. Good riddance! Speech at the U.S. Congress (May 24, 2011). You don't need to do nation building in Israel, we're already built. You don't need to export democracy to Israel, we've already got it. You don't need to send American troops to Israel, we defend ourselves... Israel is not what is wrong about the Middle East, Israel is what is right about the Middle East... The tyranny in Tehran brutalizes its own people. It supports attacks against American troops in Afghanistan and Iraq. It subjugates Lebanon and Gaza. It sponsors terror worldwide... A nuclear-armed Iran would ignite a nuclear arms race in the Middle East. It would give terrorists a nuclear umbrella. It would make the nightmare of nuclear terrorism a clear and present danger throughout the world. I want you to understand what this means. They could put the bomb anywhere. They could put it on a missile. It could be on a container ship in a port, or in a suitcase on a subway... Now the threat to my country cannot be overstated. Those who dismiss it are sticking their heads in the sand. Less than seven decades after six million Jews were murdered, Iran's leaders deny the Holocaust of the Jewish people, while calling for the annihilation of the Jewish state. Leaders who spew such venom, should be banned from every respectable forum on the planet. But there is something that makes the outrage even greater: The lack of outrage. In much of the international community, the calls for our destruction are met with utter silence. It is even worse because there are many who rush to condemn Israel for defending itself against Iran's terror proxies... When we say never again, we mean never again! Israel always reserves the right to defend itself... In Judea and Samaria, the Jewish people are not foreign occupiers. We are not the British in India. We are not the Belgians in the Congo. This is the land of our forefathers, the Land of Israel, to which Abraham brought the idea of one God, where David set out to confront Goliath, and where Isaiah saw a vision of eternal peace... No distortion of history can deny the four thousand year old bond, between the Jewish people and the Jewish land... Peace cannot be imposed. It must be negotiated. But it can only be negotiated with partners committed to peace. Address to joint meeting of the U.S. Congress (24 May 2011). Fortunately, President Obama and most world leaders understand that the idea that Iran's goal is not to develop nuclear weapons is ridiculous. Yet incredibly, some are prepared to accept an idea only slightly less preposterous: That we should accept a world in which the Ayatollahs have atomic bombs. Sure, they say, Iran is cruel, but it's not crazy. It's detestable but it's deterrable. Responsible leaders should not bet the security of their countries on the belief that the world's most dangerous regime won't use the world's most dangerous weapons. And I promise you that as Prime Minister, I will never gamble with the security of Israel. From the beginning, the Ayatollah regime has broken every international rule and flouted every norm. It has seized embassies, targeted diplomats and sent its own children through mine fields. It hangs gays and stones women. It supports Assad's brutal slaughter of the Syrian people. Iran is the world's foremost sponsor of terror. It sponsors Hezbollah in Lebanon, Hamas in Gaza and terrorists throughout the Middle East, Africa, and South America. Iran's proxies have dispatched hundreds of suicide bombers, planted thousands of roadside bombs, and fired over twenty thousand missiles at civilians. Through terror from the skies and terror on the ground, Iran is responsible for the murder of hundreds, if not thousands, of Americans. In 1983, Iran's proxy Hezbollah blew up the Marine barracks in Lebanon, killing 240 American servicemen. In the last decade, its been responsible for murdering and maiming American soldiers in Afghanistan and Iraq. Just a few months ago, it tried to assassinate the Saudi Ambassador in a restaurant just a few blocks from here. The assassins didn't care that several Senators and members of Congress would have been murdered in the process. Iran accuses the American government of orchestrating 9/11, and it denies the Holocaust. Iran brazenly calls for Israel's destruction, and they work for its destruction – each day, every day. This is how Iran behaves today, without nuclear weapons. Think of how they will behave tomorrow, with nuclear weapons. Iran will be even more reckless and far more dangerous. Speech at the American Israel Public Affairs Committee Policy Conference (March 2012). Israel without Jerusalem is like a body without a heart. Our heart will never be divided again. Hatred of the Jews has changed form but it still remains. If not racial superiority, then religious superiority is the order of the day. The world's indifference in light of this hatred has also remained. The world has very quickly become accustomed to hearing declarations only 65 years after the Holocaust, declarations of intent to annihilate millions of Jews – and the world continues to act in the same manner. The hesitancy of enlightened countries to act against extreme regimes which threaten us and threaten world peace – this too has not changed. The only thing that has truly changed is our ability and our determination to act to defend ourselves and prevent another Holocaust. This truth is a source of heavy and constant responsibility – to ensure by any means necessary the future and security of the State of Israel against those who seek our destruction. This is the last will and testament of the six million, our brothers and sisters who perished in the Holocaust and it is our duty – and we will carry it out. Speech at the opening of the permanent exhibition in Block 27 at Auschwitz-Birkenau in June 2013 . Address to the United Nations General Assembly (1 October 2013). In our time the Biblical prophecies are being realized. As the prophet Amos said, they shall rebuild ruined cities and inhabit them. They shall plant vineyards and drink their wine. They shall till gardens and eat their fruit. And I will plant them upon their soil never to be uprooted again. Ladies and gentlemen, the people of Israel have come home never to be uprooted again. Netanyahu speech at the UN General Assembly 1 October 2013 . Interview on CBS' "Face the Nation" 12 July 2014 . Comparing Israeli forces to Hamas militants. As Hamas's charter makes clear, Hamas's immediate goal is to destroy Israel. But Hamas has a broader objective. They also want a caliphate. Hamas shares the global ambitions of its fellow militant Islamists. That’s why its supporters wildly cheered in the streets of Gaza as thousands of Americans were murdered on 9/11. And that's why its leaders condemned the United States for killing Osama bin Laden, whom they praised as a holy warrior. So when it comes to their ultimate goals, Hamas is ISIS and ISIS is Hamas. And what they share in common, all militant Islamists share in common. Boko Haram in Nigeria; Ash-Shabab in Somalia; Hezbollah in Lebanon; An-Nusrah in Syria; The Mahdi Army in Iraq; And the Al-Qaeda branches in Yemen, Libya, the Philippines, India and elsewhere. Some are radical Sunnis, some are radical Shi'ites. Some want to restore a pre-medieval caliphate from the 7th century. Others want to trigger the apocalyptic return of an imam from the 9th century. They operate in different lands, they target different victims and they even kill each other in their quest for supremacy. But they all share a fanatic ideology. They all seek to create ever expanding enclaves of militant Islam where there is no freedom and no tolerance – Where women are treated as chattel, Christians are decimated, and minorities are subjugated, sometimes given the stark choice: convert or die. For them, anyone can be an infidel, including fellow Muslims. Ladies and Gentlemen, Militant Islam's ambition to dominate the world seems mad. But so too did the global ambitions of another fanatic ideology that swept to power eight decades ago. The Nazis believed in a master race. The militant Islamists believe in a master faith. They just disagree about who among them will be the master... of the master faith. That's what they truly disagree about. Therefore, the question before us is whether militant Islam will have the power to realize its unbridled ambitions. Speech at the United Nations General Assembly (September 2014), New York City, New York. As quoted in The Jerusalem Post. Speech to the United Nations General Assembly (September 2014), New York City, New York. As quoted in Israeli PM: Iran doesn’t practice terrorism like Jeter isn’t a shortstop, The New York Post, (29 September 2014). As quoted in "Israel failed Ethiopian community, president says at memorial" (17 May 2015), by Judah Ari Gross, The Times of Israel. Amos Regev, the editor-[in-chief] of Israel HaYom, is a personal friend and my conversations with him are not within the framework of my job. Hitler didn't want to exterminate the Jews at the time. He wanted to expel the Jews. Netanyahu tells World Zionist Congress 2015 that Hitler only wanted to expel the Jews, but Jerusalem's Grand Mufti convinced him to exterminate them, a claim that was rejected by most accepted Holocaust scholars. . The labeling of products of the Jewish state by the European Union brings back dark memories. Europe should be ashamed of itself. It took an immoral decision. Of the hundreds of territorial conflicts around the world, it chose to single out Israel and Israel alone, while it's fighting with its back against the wall against the wave of terror. As quoted in "EU: Products from West Bank and Golan cannot be labeled 'from Israel'" (11 November 2015), by Don Melvin and Oren Liebermann, CNN, State of Georgia: Cable News Network. Full text of address to a joint meeting of the United States Congress (3 March 2015). The people of Iran are very talented people. They're heirs to one of the world's great civilizations. But in 1979, they were hijacked by religious zealots; religious zealots who imposed on them immediately a dark and brutal dictatorship. That year, the zealots drafted a constitution, a new one for Iran. It directed the revolutionary guards not only to protect Iran's borders, but also to fulfill the ideological mission of jihad. The regime's founder, Ayatollah Khomeini, exhorted his followers to "export the revolution throughout the world." I'm standing here in Washington, D.C. and the difference is so stark. America's founding document promises life, liberty and the pursuit of happiness. Iran's founding document pledges death, tyranny, and the pursuit of jihad. And as states are collapsing across the Middle East, Iran is charging into the void to do just that. Iran took dozens of Americans hostage in Tehran, murdered hundreds of American soldiers, Marines, in Beirut, and was responsible for killing and maiming thousands of American service men and women in Iraq and Afghanistan. Beyond the Middle East, Iran attacks America and its allies through its global terror network. It blew up the Jewish community center and the Israeli embassy in Buenos Aires. It helped al-Qaeda bomb U.S. embassies in Africa. It even attempted to assassinate the Saudi ambassador, right here in Washington, D.C. In the Middle East, Iran now dominates four Arab capitals, Baghdad, Damascus, Beirut and Sanaa. And if Iran's aggression is left unchecked, more will surely follow. So, at a time when many hope that Iran will join the community of nations, Iran is busy gobbling up the nations. We must all stand together to stop Iran's march of conquest, subjugation and terror. If Iran's work on advanced centrifuges, faster and faster centrifuges, is not stopped, that break-out time could still be shorter, a lot shorter. True, certain restrictions would be imposed on Iran's nuclear program and Iran's adherence to those restrictions would be supervised by international inspectors. But here's the problem. You see, inspectors document violations; they don't stop them. Inspectors knew when North Korea broke to the bomb, but that didn't stop anything. North Korea turned off the cameras, kicked out the inspectors. Within a few years, it got the bomb. Now, we're warned that within five years North Korea could have an arsenal of 100 nuclear bombs. Like North Korea, Iran, too, has defied international inspectors. It's done that on at least three separate occasions; 2005, 2006, 2010. Like North Korea, Iran broke the locks, shut off the cameras. I wish I could promise you, Elie, that the lessons of history have been learned. I can only urge the leaders of the world not to repeat the mistakes of the past. Not to sacrifice the future for the present; not to ignore aggression in the hopes of gaining an illusory peace. But I can guarantee you this, the days when the Jewish people remained passive in the face of genocidal enemies, those days are over! We are no longer scattered among the nations, powerless to defend ourselves. We restored our sovereignty in our ancient home. And the soldiers who defend our home have boundless courage. For the first time in 100 generations, we, the Jewish people, can defend ourselves. This is why; this is why, as a prime minister of Israel, I can promise you one more thing: Even if Israel has to stand alone, Israel will stand. But I know that Israel does not stand alone. I know that America stands with Israel. know that you stand with Israel. You stand with Israel, because you know that the story of Israel is not only the story of the Jewish people but of the human spirit that refuses again and again to succumb to history's horrors. Facing me right up there in the gallery, overlooking all of us in this august chamber is the image of Moses. Moses led our people from slavery to the gates of the Promised Land. And before the people of Israel entered the land of Israel, Moses gave us a message that has steeled our resolve for thousands of years. I, the Prime Minister of Israel, care more about Palestinians than their own leaders do. Israel cares more about Palestinians than their own leaders do. Innocent and impoverished Palestinians were denied vital aid supplied from nations around the world, Hamas stole critical support for Palestinian children so that they could kill our children…I express my deepest sympathy with innocent Palestinians and those well-meaning nations who generously donated money to help them. In the Israeli democracy, we will continue to protect the rights of both the individual and the group, this is guaranteed. But the majority have rights too, and the majority rules, the vast majority of people want to preserve the Jewish character of our country for generations to come, this combination of individual rights and group rights are the definition of a Jewish and democratic state. As quoted in Defending controversial Jewish state bill, Netanyahu says ‘majority rules’ (12 July 2018) by Tamar Pileggi, The Times of Israel. Israel is the nation state of the Jewish people, which honors the individual rights of all its citizens, I repeat this is our state. The Jewish state. Lately, there are people who are trying to destabilize this and therefore destabilize the foundations of our existence and our rights, so today we have made a law in stone. This is our country. This is our language. This is our anthem and this is our flag. Long live the state of Israel. About the Basic Law: Israel as the Nation-State of the Jewish People, as quoted in Israel's Parliament Has Passed a Controversial Jewish Nation Bill (July 19, 2018) by Ilan Ben Zion, The Times. There is only one place in the Middle East where life is safe and there is only one place where the Christian community grows and flourishes," Netanyahu continued. "That place is the State of Israel. In other countries in the Middle East, Christians must either be very careful or leave the country, but not in Israel. You are our brothers and sisters, and we defend Christian rights just like we defend the rights of all religions. Google Translate: From here I am going to meet with 60 foreign ministers and representatives of countries around the world against Iran. What is important is the encounter, and a meeting not secretly or secretly, because there are many. This is in fact an open meeting with representatives of leading Arab countries that sit with Israel to advance the common interest of a war in Iran. 10:15 AM 13 February 2019, affirmed by City News and Fox News and Montreal Gazette and NBC News and Washington Post. the original tweet was deleted and replaced 11:08 AM with a similar message, except with "war with Iran" changed to "combating Iran"
Israel is not a state of all its citizens. According to the Nation-State Law we passed, Israel is the nation-state of the Jewish people—and them alone. 11 March 2019 on Instagram; "Benjamin Netanyahu says Israel is ‘not a state of all its citizens’". TheGuardian. Agence France-Presse. 10 March 2019. ; Maza, Cristina (11 March 2019). "Benjamin Netanyahu Declares Israel Nation-State of Jews Alone, Not Arab Citizens, in Social Media Spat With Actress". Newsweek. A great sense of mission guides us. A great sense of mission guides me. I act day and night in your name, on your behalf, on behalf of our country, on behalf of our people, on behalf of our land! The Israelis always wanted two things that once it turned out they had, it didn't seem so appealing to Mr. Netanyahu. … The real cynics believe that the Netanyahu's government's continued call for negotiations over borders and such means that he's just not going to give up the West Bank. A law-abiding state? Laws can be broken, bent or ridiculed. Dozens of laws which were subject the daunting legislation process under the previous government – his government! – met their early demise in the passed year, just because they were passed by parties who were later exiled to the opposition. ... Concurrently, he initiates, or enables, various wacos in his party to initiate laws which are of clear and immediate threat, amongst them laws that put to ridicule the very foundations of democracy, laws that undermine the principles of social equality, laws which bruise Israel's reputation, laws that make a mockery of war against corruption, laws that destroy secular education. And the list goes on. ... The Messiah King Netanyahu, in his view, can't make do with a mere fence protecting us against the deadly animals of the Middle East in order to salvage the State of Israel. The prime minister wishes to weaken the political system, and while doing so, dwarf his ministers as well. On the second tier, he is trying to undermine trust in holders of public positions and eliminate their ability to stand in his way. On the third tier he is doing all he can, literally all he can, to kill the free press. ... It has not been worded by a Leftist from the state of Tel Aviv, but by right wing folk who are closely acquainted with the prime minister. They speak of him in awe, some even admire him, and they undoubtedly support his political views and his macro-economical perceptions. But, none the less, Netanyahu's "big plan" – to destroy democracy in order to save the state – scares them. They shared their fears with the writer of this column, out of true and utter anxiety. He lies on a regular basis. He says what he feels that he needs to say for his own benefit, and then he does what he feels that he needs to do for his own benefit as well. And all too often it doesn’t go together. Merav Michaeli, as quoted in Demonstrators flood the streets demanding equal rights for gays (July 22, 2018) by Rocky Baier, The Jerusalem Post. Barack Obama: You're fed up with him, but I have to deal with him even more often than you.